For more than 2000 years, the Samaritan Passover has been observed on Mt. Gerizim. Even today the Samaritans continue to gather at Mt. 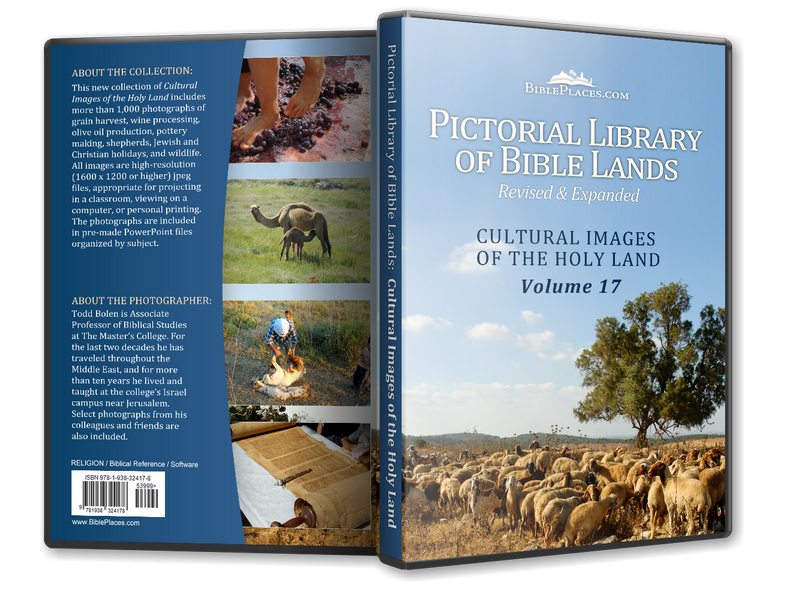 Gerizim to offer the sacrifices prescribed in the Torah (Pentateuch). The Jewish people also celebrate Passover each year, but since the Romans leveled the temple in Jerusalem in AD 70, the biblically mandated sacrifices have not been offered. Excavations at the Samaritan temple have revealed that it was constructed in the 4th century BC and destroyed in the 2nd century. Even after the destruction of their temple, the Samaritans continued to offer sacrifices on Mt. Gerizim, and do so to this day. 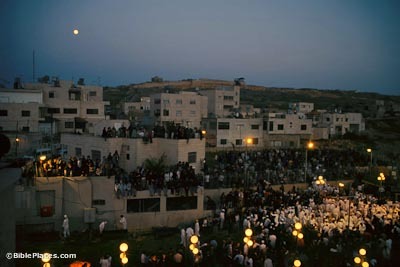 The Samaritan Passover service begins around sunset. 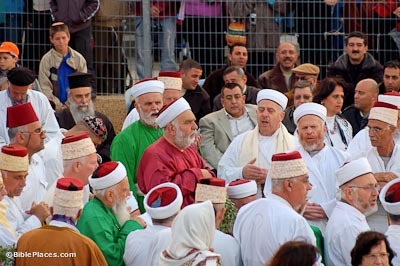 The men are dressed in white garments, the leaders wear red hats, and the priests are dressed in a distinctive turquoise-green garb. They begin by chanting and praying. When the signal is given, the head of each household reaches for his knife to slice the throat of his family’s lamb. 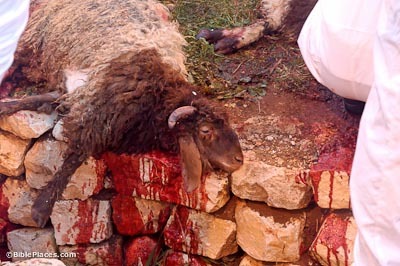 Today, 30-40 sheep are slain at Passover, about one for each larger family unit (there are no more than 600 Samaritans alive in the world today). The sheep are then skinned and roasted for most of the night. The Passover sacrifice is a family affair. 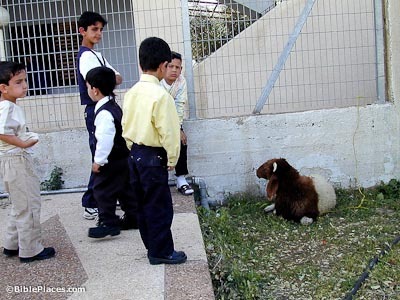 The children are present at the ceremony, playing with the sheep beforehand. In the Old Testament the Lord commanded the Israelites to bring the lamb into the household on the tenth day of the month, four days before the sacrifice. The family would get “acquainted” with the lamb in the course of those days and the children would be especially impacted when their father put the knife to the lamb’s throat. You can imagine the cries of the children as their new pet was killed, “Why, daddy, why?” The ensuing teaching moment would have been great. A sacrifice is a very bloody event. The men have blood on their hands and all over their clothes. More and more people today do not realize that meat does not originate at a grocery store. They read about sacrifice in the Bible but do not really understand what that means. 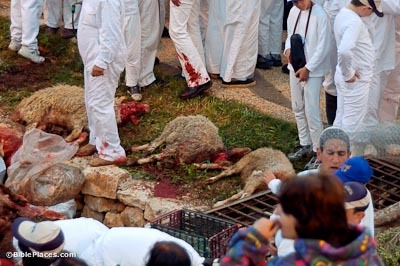 There is little concept of an animal being raised and then slaughtered, much less sacrificed for religious purposes. The biblical passages that talk about the “life being in the blood” are just words on a page that most do not really consider. To the Samaritan or the ancient Israelite, however, “the life is in the blood” must have left a profound impression of just how costly are the wages of sin. The modern sacrifices offered today by the Samaritans are much like what they have been doing since before the time of Christ. The Passover was, and is, a central part of the Jewish calendar. The New Testament records that Jesus was careful to attend each Passover during his ministry. Jesus would have been a part of the crowds, the confusion, and the bloodletting. He would have seen and heard and smelled much of the same sights and sounds and stenches. Few events today so effectively transport the modern person back to the ceremonies of the biblical days. See also Shechem, Jewish Life, and Jewish Holidays.